IMO, is not as much the width that makes barrelled easier but the widest point position. To get barrelled a SUP, it has to be designed in a ''no nose concept " as the boards of the 80' were. 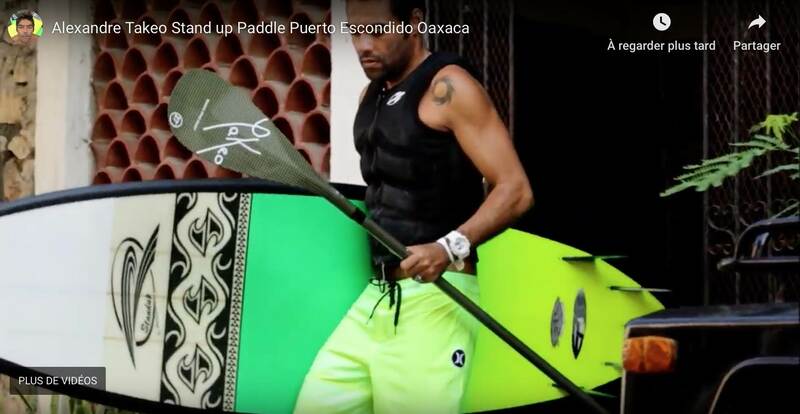 But SUP of that ''no nose" design is not easy to paddle standing up so it seems easier to paddle and go for it on board looking like the single fin one of 70' be riding as Alexandre Takeo does so impressive. As Skeee had posted this impressive video of tube riding session. Also you know Shortboard has a different outline than SUP. Due to their paddling ability, SUP has to get the wide point forward the midpoint. So SUP has a lot a foam at the front part and so it's hard to pin the face and dig the front rail in the face from the front foot. 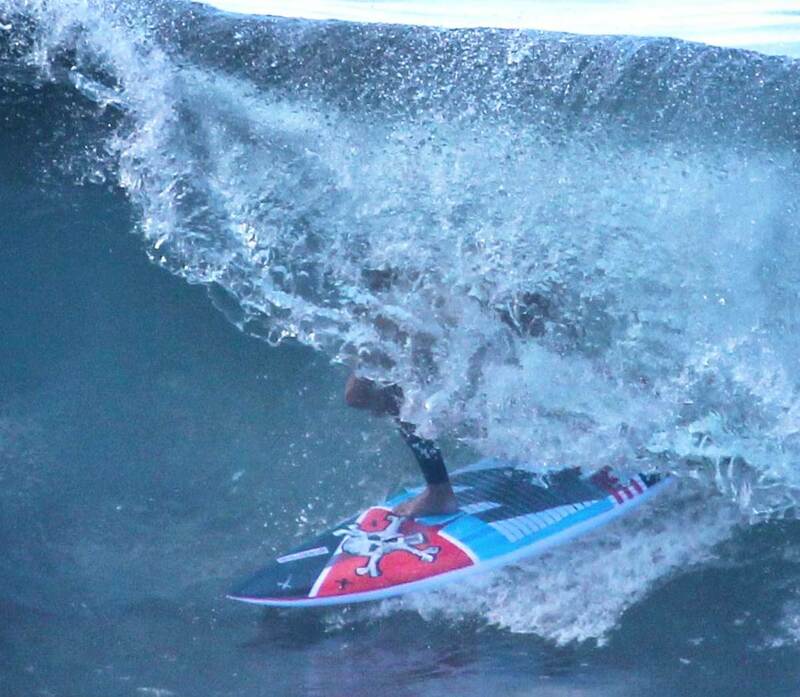 This is why I personally like the bottom channelled board cause they get hips and bite closer to nose to'' pin'' and hooking the wave face easily. But Alexandre Takeo is showing off how to do without a channelled bottom on the video been posted by Skeee. Here is an older one, but still good tube riding! Also you know Shortboard has a different outline than SUP. Due to their paddling ability, SUP has to get the wide point forward the midpoint. Actually, if you look at most SUP brands, their "world cup" contest model, if they have one, have a nose quite pulled in. Kami, I guess you mean that to tuderide their 70' boards with the wide point forward Gerry Lopez, Shauwn Thomson, etc... had to use a specific stance for tube rideng, nearly on the nose of the board, whereas the 80' boards with their wide point more centered allowed for a more "standard" tube riding position? And thus, do you advise to try to mimic the 70' tube riders for tubing with comparatively wider nosed SUPs? 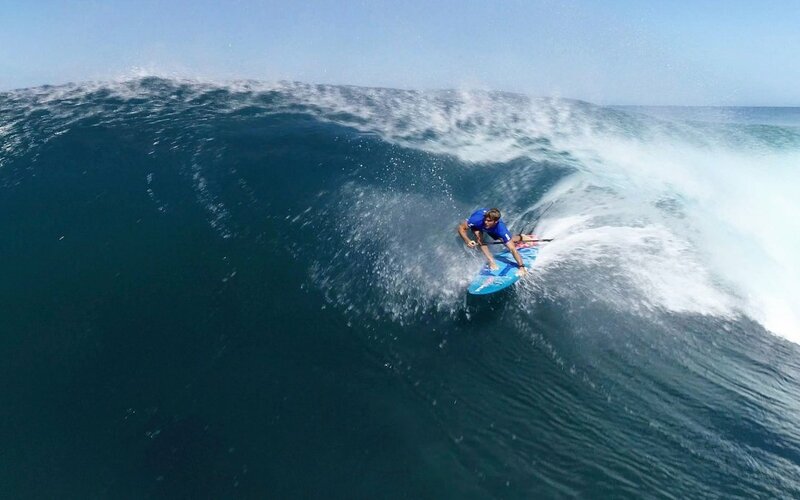 At a moment Rawson is talking about low entry rocker which is so important for wave entry as much as tube riding because the combination of the low entry rocker and pulled in nose outline holds the board high in the face. That's so important to get barrelled. The Jimmy Lewis video shows how much this combination of entry rocker and nose line is properly working. About board of the 70' compared to the one of the 80' outlines start to be more nose pull in but the meanest is the bottom shape coming from the longboard type of the 70' to the 80' was the modern concave thruster plan shape and more scooped shape as well making the tube riding stance more gliding on the 2 of the 3 fins and rail line rather than on the 70' single fin . I don't mimic to tube ride in a 70' in a longboard style on SUP, I wonder and look after shapes to do tube riding standing up in a shorty stance with the help of the paddle as a far back tail fin! I actually find the paddle a hindrance if the tube requires a crouch. I end up carrying it in one hand mid shaft. And the board? A prone longboard is also a tight fit. If it's a tight fit most sups won't fit nicely. That said on bigger tubes, not a regular occurrence, I've found my 10-4 gun works well or any of my shortboard shapes. I think the key is a pulled in tail and foiled rails. About the paddle hindrance, if the tube requires a crouch, As a goofy foot surfing mainly peeling right-handers, I usually hold my paddle on my backside trying to lay back with a balance of weight on my front foot. There is a different shape of the tube. As you surf in the Landes SW of France which is a beachy place, tube shape is not the same as reef ones. Nowadays at 65 years, I wouldn't engage a big tube at la Nord or around there nor my front or backside stance. But I know the kind of board is required for that kind of challenge... Hold the top line and avoid the bottom which can be very different from the kind of tube Jhondesu is talking which is to go down steep face... Quickly said. By looking at videos, for front side cover ups (I cannot really call them tubes) I now just keep the handle in the front hand and let go the rear, so that I can put my rear hand in the wave. It feels quite natural this way. But since I do not have a real tuberiding experience, I am not looking for tubes, healing from injuries takes so much time at my age... and I am so stiff I cannot straddle a surfboard anymore. Bazzas on the Sup's! Love this thread! I have only had a couple myself and they were not super deep, kind of gunned it in hope and it threw it out and locked me in for a bit, can't remember where the paddle was, my board was an RNB Infinity 8'8 x 32 and had as much weight on the rail as I could to hang on - quad fins helped. I find it is more about the position on the wave and where your back foot is. It is not like shortboarding where you can react in a split second, you need to read the wave well in advance and set your line early as I find that if I try to go too high or even too parallel to the wave then the board can get sucked up the face, it's all about keeping the board on track. My back foot is also right on the inside rail, toes wrapping around the inside rail biting into the face as much as I can when riding forehand. I keep the paddle in both hands and use the paddle blade to push into the face of the wave like I would use my hand on my shortboard. This also tends to keep my line better and gives me more chance of coming out. Backhand is a different story as I am use to grabbing my rail so I let go of the paddle with my bottom hand and use this to grab the rail and just hold the handle with my front hand. In this shot I have set my line and about to lean back to stall, which I will also engage the paddle blade in the face to help steady myself, keep my line and also have something to lean against if the wave starts to pinch or the foam ball catches up with me. Very cool photos of your surfing. And your board looks to be a handy size for tube riding.